I had trouble squeezing the table into this post because I've added a couple of columns. Let's start with the column containing the ratio of EnterpriseValue-to-EBITDA, otherwise known as enterprise multiple. When this value is roughly around 6 or lower, it indicates a stock that is undervalued. By this measure, then, Sketchers begins to look less like a value stock. 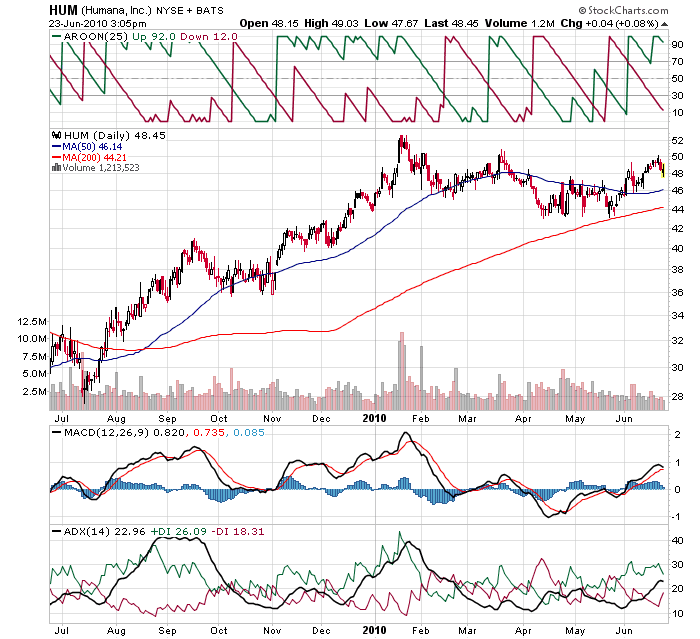 On the other hand, Humana looks like the deepest of deep value stocks. I've also included Cash Flow Yield this time. All the companies look decent on this measure but now Endo Pharaceuticals and Humana stand out with very attractive numbers. Furthermore, Humana's CFY is more than twice that of Endo Pharaceuticals. Finally, we have the Cash on Hand column. The definition I use here is Cash + Short Term Investments. According to Google Finance, Humana has $8.5 billion in cash. Oddly, Yahoo Finance has the same number on their Key Statistics page but when looking at the Balance Sheet for the most recent quarter, Yahoo lists no Short Term Investments and thus a cash level of only $1.8 billion. So I'm not sure which number is right but consider the following: if Humana has the higher cash level, then you can buy the company for only slightly more than the cash on its books. You would get the rest of the company as a going concern for almost free. That would be value indeed. The latest quarter included a net 33 cents of gains from a reserve reversal. This is a good sign in that the reserve is no longer needed but it is a bit of a gimmick in terms of the effect on the income statement and a cheesy way to "make its numbers". The commercial segment remains under pressure due to the high rate of unemployment and the shaky economic situation. Companies are unwilling to add health benefits and layoffs have reduced the ranks of the insured. The commercial segment's pretax earnings increased 8% on the reserve mentioned above gain but enrollment fell 4% from a year earlier and 2.3% during the quarter. Losing customers is never a good sign. Much of the negativity around the stock, therefore, is largely a function of the economic downturn. If you have a bullish outlook on the U.S. economy, this stock looks really ripe for a BUY. If you are downbeat on the U.S., the stock is still probably a HOLD since it's deep value characteristics suggest there shouldn't be much downside potential. In any case, after peaking in February, the stock seemed to be consolidating and has now been moving strongly upward for the last 5 weeks. 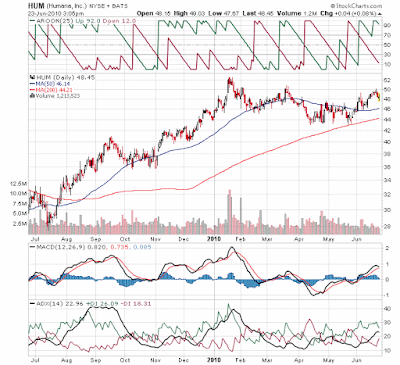 The chart above shows that the criteria we use to designate a company a Trend Leader are all present: MACD, Wilder's DMI and Aroon are all still bullish. It does look, however, that these indicators are weakening. Does that mean a buying opportunity or further breakdown? You be the judge.